BONNART - Emir Fechrredin prince des Drus. BONNART, H. - Emir Fechrredin prince des Drus. Emir Fechrredin prince des Drus. - BONNART, H.
Title : Emir Fechrredin prince des Drus..
Map maker : BONNART, H.. Date : Paris, ca. 1740. Size : 9.3 x 6.9 inches. / 23.5 x 17.5 cm. Description :Engraving published by Nicolas Bonnart (c.1637 - 1718), engraver in Augsburg since 1719. 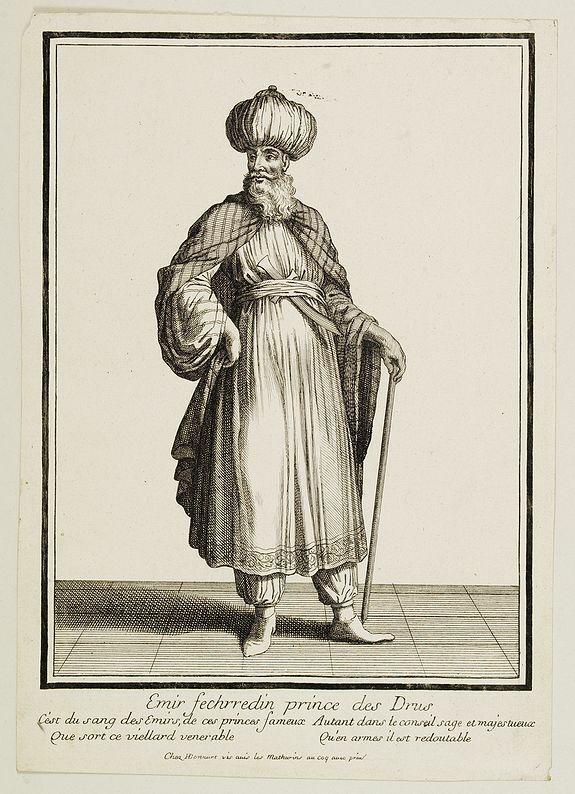 Before the nineteenth century portraits of rulers in the Islamic Middle East were a rarity. Condition : Margins cut close. Very good condition.